A TV screen contains the annotation “News” and shows a man at a desk who is presumably a news announcer. Announcer: Public service reminder. If you haven’t adjusted your computer for RAM Savings Time, it’s not too late. Expand your computer’s RAM at no cost. Announcer: Just open your computer, unplug RAM chips from the top, and plug them in at the bottom. A man and a woman are sitting on a sofa. Man: What a load of crap! Woman: It’s on TV, honey, it must be true. An illustration in the next panel shows RAM chips inside a computer. Voice: Open your computer. 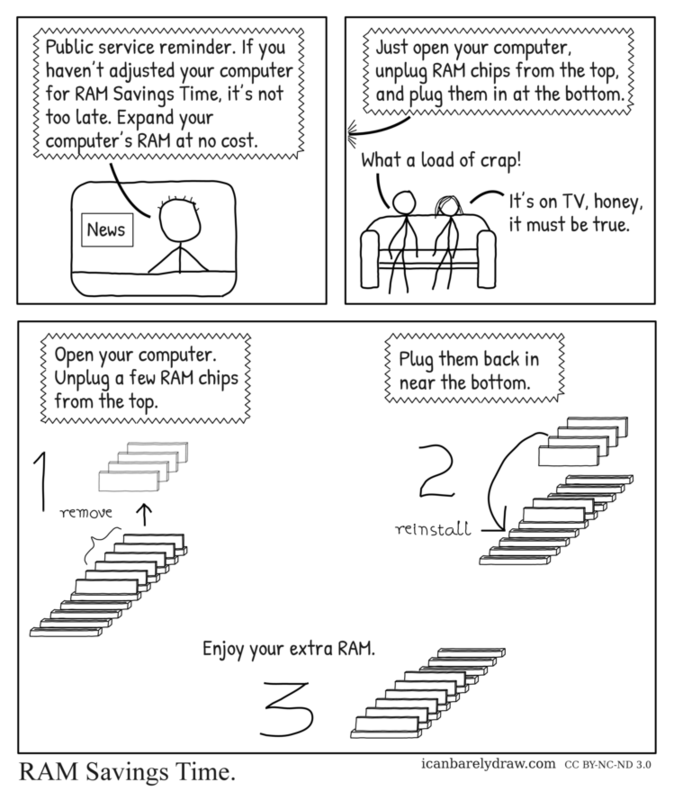 Unplug a few RAM chips from the top. Voice: Plug them back in near the bottom. The illustration shows, in step 1 annotated “remove”, four RAM chips being unplugged from the top end of the row of RAM chips, leaving behind two still plugged in and four empty slots above and below them. The illustration then shows, in step 2 annotated “reinstall”, those four RAM chips being plugged into the bottom four empty slots. The illustration shows, in the final step 3 annotated “Enjoy your extra RAM”, the lower six slots occupied by RAM chips and four empty slots above them.